The Pissweak Kids, I think. Over the two years of The Late Show, there were various sketches starring children ranging from 8 – 14. They eventually became known and credited as The Pissweak Kids. What originally began as sketches from The D-Generation in 1986 – 1987 as Tommy Cravat Jnr promoting pissweak theme parks, the idea was rejuvenated for The Late Show, starring a few kids (explained later) and parents exploring theme parks that are promoted extravagantly, but end up being way below expectations – pure pissweak. Each ‘Pissweak World‘ would be a different theme, with poorly constructed amusement rides, exhibitions, and entertainment that was hosted by a dull looking but bewildered Tom Gleisner. Even though The Pissweak Kids attended each theme park, they were never entertained to the maximum pleasure you could receive. During the Second season, The Late Show stepped away from the Pissweak World theme parks, and created the mini show Charlie The Wonderdog. Charlie The Wonderdog was mostly created by Tom Gleisner, with Charlie being Tom’s actual dog in real life. Charlie The Wonderdog was a loose piss-take on animal hero shows, such as Skippy and Lassie, which Charlie played a family dog owned by Gramps, played by the late Charles ‘Bud’ Tingwell. Gramps was always joined by The Pissweak Kids (from The Pissweak World sketches) and living in the fictitious Havenswood National Park. 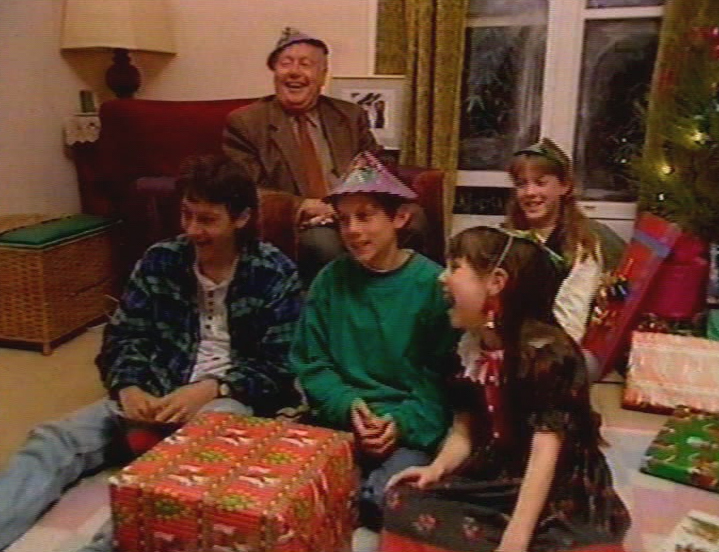 Each episode revolved around the peaceful and calm Havenswood, where Gramps and The Pissweak Kids would either be doing a nature study research, solving crimes, or investigating an incident that would coincide with a radio report (voiced by Rob Sitch). Just when disaster strikes, Charlie comes to save the day. A really popular episode of Charlie The Wonderdog is ‘Dead Man’s Weir’, where the eldest Pissweak Kid (Justin Anderson) plays two characters – regular “Peter”, and “Foolhardy Cousin George”. Amazingly, “Peter” isn’t in the episode, but “Foolhardy Cousin George” is in town and nearly drowns in Dead Man’s Weir, only to be rescued by Charlie. Foodhardy Cousin George is still popular to this day, google the name and you’ll see more. With the 20th Anniversary around the corner, I managed to track down Nic and Justin Anderson, brothers in real life and the youngest and oldest male Pissweak Kids. Justin is in black, Nic is in blue. How old were both of you when you became a member of The Late Show cast? Can you remember what was going through your mind when you were asked to be a ‘Pissweak Kid’? I had previously filmed a spot for a 7 up sketch that was never aired, and was surprised to be asked back to film the Pissweak World sketches. I never expected there would be more than one. I was just asked to come along because they needed another kid to be in it, I really had no idea what I was getting in to. The whole family can be found in the pissweak world sketches, our middle brother, mum and dad all make an appearance. How hard was it to film some of the Pissweak sketches? It was a blast. I had no trouble doing anything that was asked from braving fierce flames to the icy cold waters of Dead Mans Weir. It was always a lot of fun, and nothing was taken too seriously, the hardest part was trying too look sad while being put in ridiculous situations, but Tom, Santo and Uncle Rob (as we called him at the time) always made it a good time. Were any of you able to give any creative ideas and jokes? I’m sure there may have been a few, I think the biggest joke was my appalling green checked shirt that they insisted i wear in every episode after the second Charlie. I still have it somewhere. I think my D grade acting abilities were probably enough input. Being so young when I filmed that not many people recognise me now, but if it ever gets mentioned it’s one of the first things that comes to peoples minds. I remember being sat down by Rob and he was telling me not to tell my mum that I was going to have to swear on camera, he always made things so fun. What was it like to work with the legendary Charles ‘Bud’ Tingwell? Did he give you any acting advice? Absolute pleasure to work with, he was a real gentleman, and always had a pocket full of mints. Some of the advice he gave me I still use today. But thats between Bud and I. To be honest with you at the time I had no idea who he was but I knew he must be important because people always asked about him, I just remember him being such a nice and genuine man, always had a lot of time for everyone. How easy was it to ‘ham’ up the acting for Charlie the Wonderdog? The way the scripts were written that they couldn’t be done any other way apart from over the top, it was a heap of fun. I wasn’t hamming it up, I’m just a terrible actor, but being a young kid with a face full of teeth they thought it was funny to give me the hardest lines and progressively put in bigger and harder words to say, most of the time I didn’t even know what I was talking about, I guess that’s what makes it funnier. How long did each episode take to film? Was it all in two days or did you film it the week it was to air? Hahaha, each episode usually took a couple of hours to film, depending on how many locations we had to go to, and they went to air the same week. Do you still keep in contact with the other Pissweak kids? Of course my brother Nic, but I haven’t seen the girls for a long time. How does it feel to be immortalised on the DVDs, as well as fans quoting your characters on Facebook / Twitter? It was great to be a small part of such an amazing show that still has a place in the hearts of so many people. I am as much a fan of their work as everybody else, and it is great to see that “The Pissweak kids” are still fondly remembered. My favourite quote is still from Dead Mans Weir when Laura says ” Lucky he came to this picnic in a wetsuit”. Obviously at the time I had no idea the impact the show was going to have. I’m just glad people are still getting a laugh out of it and that Working Dog has now become such a successful identity, they thoroughly deserve everything. I still do the odd acting spot, I have been on Underbelly, Blue Heelers, Rush, Stingers and various other shows and commercials. But you can usually find me at Draculas Cabaret in Melbourne. I am the bar manager there. Nothing terribly exciting, once I realised how bad I was at acting I stopped doing that, currently trying to get into the MFB. Thank you heaps to Justin and Nic. The guys were ever-so-open to make time to chat about their experience and memories. Nice work guys! (Just keep away from Dead Man’s Weir and I’ll pop around for Dickhead Tonight). NOTE: If you were apart of the show (as an extra, regular audience member, production staff) or know someone who was (family, friend, word colleague) please e-mail your details to champagnelateshow@gmail.com if interested in a friendly chat down memory lane. Im the parent of the Pissweak baby, Mel who is now 27 years old. I attribute her wicked sense of humour to the time she spent with Rob and the team. Didn’t some of the Pissweak Kids also appear in Bush Kids? This was a radio serial broadcast during the Richard Stubbs show on Triple M in the mid 1990s, from memory. I’m sure that one of the Pissweak kids appeared as the son on The Bob Morrison Show, and in t.v. commercials. One ad was for World 4 KIds, Coles Myer’s unsuccessful mega toy store chain. Great memories, thanks heaps for sharing.